To observe International Day of Women and Girls in Science on Feb. 11, The Argus spoke with female-identifying faculty and students in the sciences at Wesleyan to understand the experience and unique challenges that come with their positions. During their interviews, many students and faculty brought up implicit biases that everyone holds, as well as smaller yet important barriers that women students have to overcome, like hesitation to ask questions in the classroom or to approach professors one-on-one. Despite biases, a high percentage of undergraduates who identify as female major in the sciences. According to Director of Institutional Research Michael Whitcomb, 292 of the 563 current undergraduate STEM majors—52 percent overall—are women. Still, woman STEM majors have faced challenges in navigating academics at the University. Carli Poisson ’18 highlighted the experience of taking big introductory classes, which varies dramatically from professor to professor—and student to student—so the level of support and comfort that each student has can encourage or deter them from pursuing a STEM major. Gender diversity and individual experiences also range widely among departments. The distribution of women students across STEM fields differs significantly based on major, with fields such as physics, computer science, and math demonstrating much lower percentages of women majoring in those fields, as compared to fields such as microbiology, neuroscience, and chemistry, which are more evenly distributed, or even skewed toward higher numbers of women than men. Despite this numerical majority, a variety of factors still discourage underrepresented minorities from joining STEM majors. Recent alumna and chemistry major Stacy Uchendu ’17 concurred with Mukerji’s assessment of student discouragement. Women students face other deterrents that operate in more latent ways. According to Burke, prejudiced professors can work to improve their behavior, as long as they are made aware of their own implicit biases. Along with female students, women faculty also experience disenfranchisement and discrimination in STEM fields. Representation of women among the STEM faculty is significantly lower than students at about one third: only 29 of the 92 STEM faculty members are women. Associate Professor of Chemistry Erika Taylor noted that her own internal drive, rather than external support, was key to her success as an undergraduate and graduate student. Professors also commented on the expectation of masculinity in STEM fields, and the complicated territory of expressing femininity while still appearing professional. Taylor later shared a personal anecdote, recalling a male colleague at a conference rudely questioning whether she deserved her position at Wesleyan, or if she had just been hired because she was a woman. Although he apologized ten years later at the same conference, she commented on the self-doubt that those types of harmful, pointed interactions can introduce into women scientists’ minds. Beyond professional setbacks and frustrations, Etson discussed the difficulty of juggling her career pursuits and her desire for a family. MB&B Chair Amy MacQueen expressed similar sentiments, reflecting on a lifetime of support in her professional life but gendered expectations in the domestic sphere. Along the same lines as discussions of motherhood, professors and students brought up income level, race, and mental health as they intersect with being a woman in STEM. In addition to the more obvious goal of a diverse student population, Burke explained that improving the representation of underrepresented groups among faculty has become more of a priority in the past four or five years. Beyond faculty diversity, some departments have realized that their material is less accessible for low-income students. For example, Assistant Professor of Computer Science Victoria Manfredi explained that students who don’t have access to a fast computer often find themselves at a disadvantage in computer science courses. Poisson, too, highlighted the added challenges of low-income students. 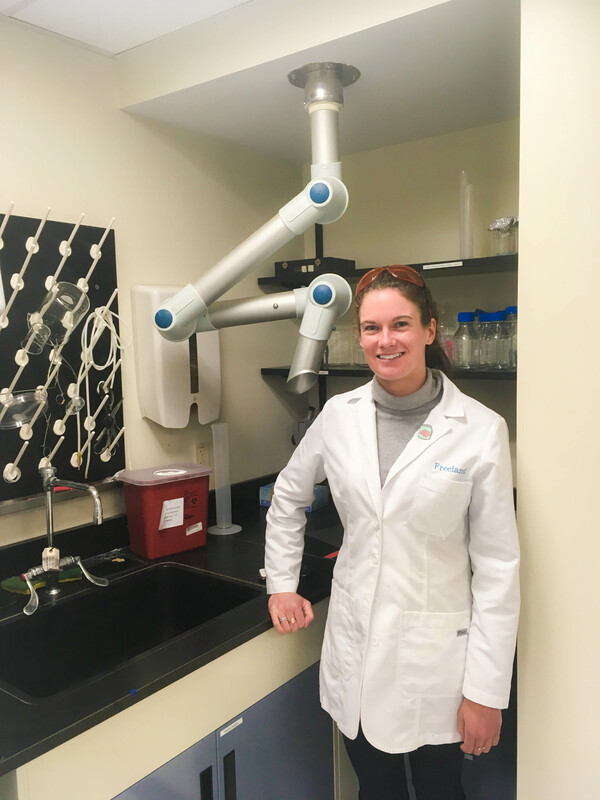 She explained that because of the major time commitment, low-income students can find it difficult to find work in a lab, as many of the positions are unpaid. Other students working in labs may find that having a mental illness puts them at a disadvantage in the workspace. MB&B and College of Integrative Sciences (CIS) major Olivia Hutter ’18 addressed this, noting that she appreciated her lab space as an understanding environment, but recognizing that other students might not be so lucky. “I’m in a wonderful lab with wonderfully understanding PI [Principal Investigator] and grad students, who allowed me to take the steps back that I needed, and then gave me the opportunity to come back into the lab when I felt like I was ready,” she explained. Melisa Olgun ’20 elaborated on the difficulties confronted by women who are also members of other underrepresented groups in STEM fields. Many students and faculty recommended on-campus resources and offered advice for other women who are seeking to enter STEM fields, but may be unsure of what the field entails. Hutter noted that at Wesleyan, there are a number of organizations for minority groups in STEM fields, many of them under the umbrella of the Natural Sciences and Math (NSM) Coalition. Olgun also commented on minority representation in STEM, particularly when it comes to racial diversity. In addition to advice, University professors and students commented on what they viewed as positive aspects of the Wesleyan environment, which, many noted, is more inclusive than other institutions. For example, Wesleyan has a number of institutions for students, and especially minorities, in STEM, including WesMaSS (Wesleyan Mathematics and Science Scholars Program), the McNair Program, STEM Zone, and WesWIS (Wesleyan Women in STEM). The NSM Coalition is working to standardize the process of becoming a TA as a way to promote diversity among student TAs. Taylor noted that she believes the University is making steps forward. In addition to recent boosts to the racial and ethnic diversity among faculty, Uchendu highlighted the fact that minority students often join together to help and support one another, offering a sense of community outside of official organizations. Hannah Fritze ’18 also stressed the value of community, especially when reflecting on her experience as an astronomy major. “We’re all really close, and whether it’s something you need or not, it makes you acknowledge everybody as people more,” she said. Despite the great strides that the University and the country has made in recent decades, obstacles seem to persist.